Transports your heaviest supplies. 250-lb. 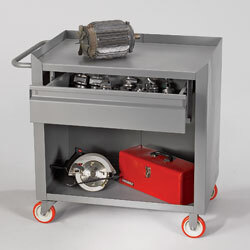 capacity, 26"W x 20"D x 6"H drawer features a full-width recessed handle and a padlock hasp. Heavy-duty gauge steel. 36"W x 24"D shelves. Enclosed bottom shelf has a 1-1/2" front lip. Non-marking 5" polyurethane casters, 2 rigid and 2 swivel with brakes. 1,200-lb. capacity. FACTORY QUICK SHIPFOB ILLINOIS.